MPG-o-Matic Nissan Altima Hybrid Review Summary: The Altima Hybrid is a mid-sized front-wheel-drive sedan that competes with the Honda Civic Hybrid and Toyota Camry Hybrid in the “hybrid that doesn’t look like a hybrid” market. Hybrid vehicles typically get better gas mileage in the city than on the highway. The Altima is a case in point. 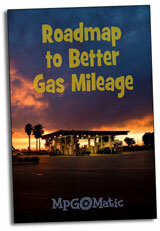 The EPA gas mileage estimates for the 2008 Altima Hybrid come in at 35 city / 33 highway. In a week of driving in mid-thirty to fifty degree weather, our gas mileage met those numbers. The Altima Hybrid doesn’t draw attention to itself and is nearly indistinguishable from a standard Altima. Overlook the trio of hybrid badges on the fenders and trunk lid, and your friends and neighbors will never know you drive a hybrid. After all, who would expect a hybrid with dual exhaust? Underneath the hood and those smartly designed covers, the Altima Hybrid is fitted with a 2.5 liter four-cylinder engine that produces 158 horsepower, in tandem with an electric motor that delivers an additional 40 horsepower. Add up the numbers and you’ll find that the Altima Hybrid is not underpowered by any means. The 2008 Altima Hybrid is an Advanced Technology Partial Zero Emission Vehicle and a bit of a rare bird, as Nissan has restricted sales to just eight states: California, New York, New Jersey, Connecticut, Massachusetts, Vermont, and Maine. While our review unit lacked the optional leather interior and sophisticated navigation package, it’s roomy and comfortable, with a crisp design. The standard sound system includes an integrated satellite radio, steering wheel controls, and a face-mounted iPod jack. Starting the Altima Hybrid is a bit out of the ordinary. Don’t worry if the gas engine doesn’t start right up. You’ll typically roll out of your parking spot in EV mode, under silent electronic propulsion. If the engine is cold, it will start up within moments and continue running until warmed up. The Altima Hybrid is remarkably quiet in EV mode. In cars without the Navigation system’s Energy flow monitor and energy/fuel history monitor – part of the optional $6,400 Technology Package – the only visual indication of EV mode is a small orange indicator. The engine switches automatically to conventional propulsion while under acceleration. The Altima will switch back to EV mode while decelerating at speeds under 40 miles per hour … it’s eerily silent at stoplights. In fact, the Altima Hybrid might be too quiet in parking lots and driveways … without the rumble of an engine, it’s easy to sneak up on folks. All-in-all, we found the Altima Hybrid to be a solid choice for folks who do a significant amount of in-town driving and are looking for a roomy sedan with excellent city gas mileage. If you’re in the market for a hybrid that doesn’t look like a hybrid, there’s a good chance the Altima will fit the bill.